What are the best iPods/MP3s for swimming? Instantly compare the top picks. 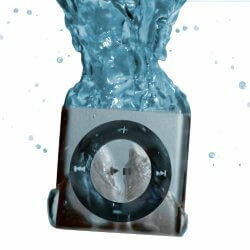 Why are Waterproof iPods/MP3s Best for Swimming? Can I Use Waterproof iPod Nano for Swimming? How Deep Can I Go with Waterproof iPod/MP3 Players on This List? What are the Best Waterproof Headphones for Swimming? Why Can’t I Use Bluetooth Waterproof Headphones in the Pool? Know About a Better Waterproof MP3 Player? Rated depth as specified by the manufacturer. We did not test it. For safety reasons don't use under 10ft (3m). Related guides: Click here, for waterproof Bluetooth headphones. What are the best swimming headphones? 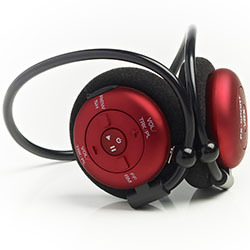 Below you can find the top 7 waterproof iPod/MP3 headphone sets that are perfect for swimming, even underwater. In the comparison table, you can compare best waterproof iPods with other swimming MP3 players. All are suited for underwater use, just pick one you like and make swimming fun again. If you want to listen to your favorite music during swimming, the best and most reliable solution is a waterproof MP3 player, like iPod Shuffle, and waterproof in-ear headphones. This technology is very basic but works best underwater. See why you can’t use Bluetooth headphones underwater below. 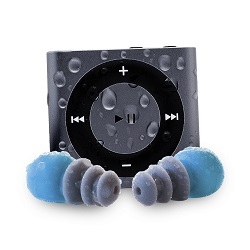 Waterproofing small earbuds and MP3 players is cheaper than bigger headphones or your phone. There is no waterproof iPod Nano that you could use for swimming without any additional protection. What you can do is get regular iPod Nano and protect it with a waterproof bag. Get some good water protected headphones and you’re good to go. Just keep in mind that this set will cost you more money, plus it will probably be less comfortable for swimming purposes due to its size. In the end, waterproof iPod Shuffle is still the best option for swimming in the pool or the ocean. All of the iPod/MP3 sets on this list are perfectly safe to use for swimming in pools and some are protected from the water up to great depths. In fact, our top pick (iPod Shuffle by AudioFlood) is rated to be completely waterproof up to 200ft in depth which is useful even for diving purposes. Read the reviews for each model to find out more about it. Keep in mind to clean your waterproof iPod with fresh water after using in the sea. Salty water is a bit more aggressive with electronics than fresh water. There are many good waterproof headphones suitable for swimming, but when it comes to the absolute best, Swimbuds are the way to go. When you buy your own waterproof MP3 player you’ll probably get additional headphones with it, but those usually aren’t the best. It’s not uncommon to have a lot of problems keeping them in ears, especially during fast, underwater movement, like doing flip turns. Unless you’re using a swimming cap or have some other way to stick the headphones in your ears, you’ll likely experience frequent issues. Get more info in our guide on the best headphones for swimming. Bluetooth headphones don’t work underwater because the signal doesn’t transmit the same way underwater as in the air. This makes wireless Bluetooth headphones useless for swimming. The moment your headphones touch the water you will experience signal interference. This means you’ll eventually lose the Bluetooth connection and headphones will stop working. As of right now, we still don’t have cheap, good, wireless technology that could be used for underwater sound streaming. For above water sports like kayaking and board paddling, you can still use waterproof wireless headphones. For swimming, this is the best waterproof iPod/MP3 on the market right now, period. 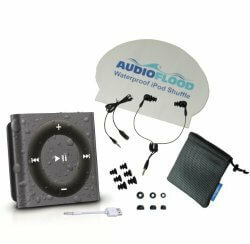 Whether you’re making laps in a pool with fresh water or enjoying any kind of underwater activity in the salty sea, this Apple iPod Shuffle waterproofed by AudioFlood will do the job perfectly. This is a top rated iPod for swimming on Amazon for a reason. The whole clip-on casing of the Shuffle is made waterproof up to 200ft in depth. This is serious protection from water and it’s very unlikely you’ll ever need to go deeper. Getting good waterproof headphones makes this iPod also great for diving, meaning more fun for you. Durability for above water use is great, as you’d expect from Apple iPod. It’s small and sturdy and doesn’t differ from the standard non-waterproof edition. You can easily use it for sports or just everyday listening. The whole set has 2 years of warranty and AudioFlood has great customer service if you’re ever in need of getting it replaced or fixed. If you take good care of it, it will serve you for years. Make sure to rinse it with cloth and let it dry after use. This is especially important if you use it in salty water. Many people report using it for years without any problems. This is still Apple quality after all. Together with standard, non-waterproof Apple earbuds, you get additional in-ear earphones made specifically for in water use. They come with a nice selection of swimming ear tips and a short cord with an extension., just in case you need it. This way you can wear it in many different ways. Earbuds are 100% waterproof and you don’t have to worry about getting them wet. The only problem water makes, is that it slightly changes the sound if you don’t have the best fit. But for most people, this is not going to be a big issue. In case you’re one of those people who just can’t seem to keep the earbuds in, you can try different waterproof headphones like these Swimbuds. You can also wear a swimming cap to better stabilize the fit. It features 2GB of space which isn’t much compared to today’s MP3s but is enough for over 500 songs and considering this is Apple Shuffle (no screen) you’ll probably never want more songs than that. The battery has about 15 hours of playtime and is charged by regular USB cable. The sound quality is pretty good, especially considering this is an MP3 set for swimming purposes. It sounds the same as regular iPod Shuffle. The clean, detailed and balanced sound you can enjoy on the go. To be completely frank, you’re probably not going to focus on sound quality while swimming or diving and if you are, then get different headphones. Find best workout headphones here. The sound can be a bit muffled sometimes, depending on your fit and the earbuds you’re using. This means the sound isn’t perfect but it’s the best you’re going to get out of any waterproof MP3 set available. If you’re looking for, small, durable, waterproof MP3 player you can go swimming with, then look no further, get iPod Shuffle by AudioFlood and never again suffer the silence even if you’re 200ft undersurface. This is another very popular iPod Shuffle set very similar to the one made by AudioFlood. Waterfi iPod set is slightly more expensive and comes with fewer accessories; otherwise, it’s at least as good if not better. Wearing this iPod you can go up to 210ft underwater, which is even more than the AudioFlood model. Not that you will actually need to use these at 200ft+ depths, but it’s good to know the limit. The problem is the headphones, which are IPX7 rated, but this means you can only go about 10ft underwater with them. It looks and feels like the standard 4th generation Apple iPod Shuffle, small, sturdy and simple to use. It can be conveniently strapped on to your goggles or wetsuit and because it’s so small and light it won’t bother you. The wires are slightly longer than with AudioFlood version at 11 inches which might be a nuisance since the cord flaps around a lot underwater. But for some people, the cord is still too short causing frustration during swimming. Additionally, you get different sized ear tips and original, non-waterproofed Apple earphones. The waterproof headphones might have a bad fit for some people, in this case, you should look into Swimbuds Sport, which are the best headphones for swimming on the market right now. The combination of waterproof iPod Shuffle and Swimbuds™ Sport is the most reliable option, though a bit pricey. This waterproof shuffle comes with a battery life that lasts up to 15 hours and can store at least 500 songs/podcasts in 2GB of onboard storage. The small, durable and tested iPod Shuffle offers a lot of flexibility and an ease of use. You’ll learn what buttons to press to control volume or skip songs in a heartbeat. Music can be put on the iPod via iTunes or various other software which is compatible with it. Sound quality isn’t any different from the standard iPod, after all, it’s the same product, just made waterproof. This doesn’t mean sound quality is bad, in fact, it’s among the best you can get for swimming. The set is quite pricey for such a small MP3 player, but when it comes to underwater performance you will have a hard time finding better. Apple is known for producing top-notch products and to really have no worries about using it underwater you get a 2 years waterproof guarantee by Waterfi. If you want a durable and reliable iPod for swimming, Waterfi version is one of the best and with proper maintenance, it will last you for years. iPod Shuffle by Underwater Audio is a great choice because you get a nice discount on Swimbuds SPORT (best for swimming). Just add both items in the cart and get a discount. Swimbuds™ are the best earbuds for swimming you can get right now. Click the previous link for more info. Altogether it’s going to cost you a bit more than the iPod set from AudioFlood, but the quality of waterproof earbuds is probably a bit better. The iPod Shuffle itself is waterproofed by Underwater Audio which specializes in swimming accessories. It is the standard 4th generation iPod Shuffle. The MP3 is safe to use at depth of about 10 meters, as it was tested at that depth, even though it’s IPX8 rated. 10 meters is plenty of flexibility for most swimmers. Durability is the same as with regular iPod. It’s small and compact but works like it’s supposed to. Can be used in salty water as well, just make sure to clean with a splash of fresh water afterwards to get the salt off. With proper care and a 2-year warranty, you’re guaranteed to get a lot of use out of it. See more durable earbuds here. The Underwater Audio iPod Shuffle set comes with a pair of short waterproof earbuds, but they aren’t as good as Swimbuds. To get the most out of the MP3 player get Swimbuds as well, because you’ll save a lot of frustration and time. Regular earbuds which you get in the set tend to leak water more thus needing you to keep adjusting the fit all the time. It has 2GB of space which is enough for over 500 songs and 15 hours of playtime, just like the regular Shuffle. The small and compact design makes it easy to attach to your swimming wear or a swimming cap. The sound quality also doesn’t differ from the regular, non-waterproofed iPod Shuffle. It produces a rather balanced sound, but this greatly depends on the headphones you’re using. When it comes to sound quality during swimming, iPod is pretty much the best that’s available on the market right now. If you’re looking for a solid, waterproof iPod Shuffle without headphones, then Underwater Audio offers a great choice. Together with Swimbuds™ discount, this is one of the best MP3 sets for swimming. These are designed specifically for various sports, including swimming. Their smart design and good sound quality make them a great choice for any semi-serious swimmer. Note: They’ve added new functionality for swimmers: a tempo trainer and a lap time pacemaker. So, these are perfectly suited for swimming laps in a pool. What’s the difference between VR1 and VRX models? VR1 is an outdated model that’s not available anymore. VR1 is not compatible with Real Life Coaching Apps and has a slower charge speed, otherwise, they are basically the same headphones with the same drivers. VR1 charge time is about 5 hours, VRX charges up in less than 2 hours. If you want to use the apps and want all of the functionality FX-Sport can offer, go for the VRX model. Either of them can be used for swimming. For swimming purposes FX-Sport VRX aren’t “swim-ready” out of the box, you have to purchase an additional accessory which is basically a silicone Swimcap for the MP3. Get silicone swimming bag and swimming cap here. Together with the swimming cap, you can safely use the MP3 player in the water. One of the most annoying problems with waterproof headphones is getting water in the ears. FX-Sport VRX does a better job of keeping water out. Once you put the Swimcap accessory on the MP3 no water is getting in contact with it. The Swimcap is basically a specially designed silicone bag for the MP3 to be put in. You can still put them on your head and wear them comfortably, as well as hear the music. There is no specification of how deep these are rated for, but they are perfectly safe to use in even the deepest pools. Just don’t take them ocean diving with you as they’re probably not made to survive the pressures deep underwater, snorkeling, on the other hand, is fine, but that wouldn’t be smart for security reasons. You need to hear what’s going on around you when diving. You can easily use them in salty water since the water doesn’t really come in contact with the MP3, just wash it with fresh water afterwards. The built quality is good, it’s sweat resistant as well so you can easily use it for other sports activity. The headphones are made out of plastic, but the better kind which doesn’t make you worry about breaking them. The control buttons are well made and feel sturdy. The headband is very flexible and you can bend it in all kinds of ways without any damage. The fit is surprisingly good. Because of their plastic design, they are light and once you hook them to your ears they stay put. You can easily run, exercise or even do yoga with them without much adjusting. To keep it in place in the water you need to use a swimming cap which you get together with the Swimcap accessory. Once you put it on they don’t budge. You can even jump in the pool head down without having to worry about it moving. The headphones stay on great during fast swimming, even underwater. This is perfect for fast lap swimming or practicing jumps. You can get the silicone MP3 Swimcap and swimming cap on FX-Sport website. The only bad thing about it is the whole procedure of putting them on before a swim. It’s quite a hassle, but it’s more than worth it since you avoid problems afterwards. Approximately, it takes 2-3 minutes to adjust everything so this isn’t very long for a hassle-free swim of an hour or more, depending on how long your swimming sessions are. If you’re a regular swimmer these headphones will save you a lot of time adjusting the fit because once you put them on, you’re good to go for the whole duration of the swim. They’re comfortable enough for a workout, but since they are on-ear design your earlobes will get a bit irritated if you wear them for half a day. Thankfully this is a sports MP3 which you’ll probably only use for a couple hour workouts and you’ll probably not spend half a day in the pool either. With 8GB of onboard space, there is plenty of room for your favorite music. With the updated VRX model you get hours of pre-loaded training programs that you can simply activate with built-in controls. You can pick anything from swimming, athletics or even golf. This is something other MP3s don’t offer. The training programs cover everything you can imagine, from weight lifting to belly fat training. The training programs give you instructions on what exercises you’re supposed to be doing, just like a real trainer would do. The music automatically stops, training program gives you instructions and then the music resumes so you always know what you have to be doing. The MP3 plays .mp3 and .wma formats, but not .vmw or .wav which probably isn’t even a big issue since the latter two use a lot more space. It is also iTunes compatible, just connect to a PC and add your favorite songs. The battery lasts for solid 5 hours upon fully charged, which is good battery life, but not great. Anyways, for a regular swimmer, 5 hours should be plenty of time. Charging time is the same, plug it in for 5 hours (VRX only 2 hours) and you’re ready to go. We noticed a small battery drain when not in use, so if you don’t use the MP3 for a while after being fully charged, keep in mind that the play time will shorten for every day, not in use. It seems the device is never fully shut down. To solve this, just charge it before using it. The controls are quite easy to use once you get used to them. With a bit of time, you will learn how to change songs even underwater. The sound is very good compared to other waterproof MP3s, this is because of a completely different design. Together with the Swimcap silicone bag for the MP3 you also get ear tips which are supposed to block the water out of your ears. Sound quality is much better when your ears aren’t full of water and using the ear tips helps with that. This doesn’t make the sound completely clear since some water still gets in if you dive, but it stays good enough even for listening to audio books. When you dive into the water sound volume always goes down, this happens with all waterproof headphones or MP3s, thankfully FX-Sport is loud enough to keep the volume high enough even underwater. The overall sound quality is nothing special compared to regular headphones, but considering these are sports headphones you can swim with, the sound quality becomes an advantage. The bass is quite good with balanced mids and highs. The audio is clear enough to listen to audio books while swimming as well, great for doing 2 things at once. You can also ramp up the volume to unhealthy highs but this distorts the sound quality so you probably won’t be doing that. The sound quality slightly changes underwater, but compared to other waterproof alternatives, FX-Sport sound is one of the better ones. As long as you don’t compare the sound of these headphones to high-end audiophile models, you’ll be more than happy. If you’re serious about swimming and don’t like adjusting the fit frequently with waterproof earbuds, get them, they stay in place better than any other waterproof headphones out there. For a waterproof design that enables you to swim or workout with a good sound quality, great fit even underwater, FX-Sport VRX are the best on-ear headphones with MP3 you can get right now. When it comes to waterproof earbuds for swimming, this bundle of Swimbuds headphones and the 8 GB SYRYN waterproof MP3 player is an amazing value. In fact, we think this set is the best value MP3 for swimming. This could easily be the next best audio solution you take for all of your watersport activities. It’s easy to be skeptical of claims that any waterproof product will stand up to everyday use and exposure to water. But these really do. The Swimbuds have a good design that fits tight, and they will work even if water gets into the ear canal (though that can lower the sound quality a lot). The SYRYN MP3 player is also build to the rugged IPX-8 specifications and rated for at least 10’ of submersion. A 1-year warranty is provided for the Swimbuds and the SYRYN MP3 player. Customer support is rated very well, so definitely reach out if you have any issues with this product in the first year. Getting a tight seal with waterproof earbuds is important, so it is worth taking the time to establish a proper fit with the Swimbuds headphones. There are four different ear tip sizes provided that will fit a variety of ear shapes and sizes. You may even want to maximize the fit by pulling up on your ear with one hand as you insert the earbud with the other hand to get a good seal. With the right eartip selection and fitting technique, these earbuds should be comfortable enough to wear for a few hours. 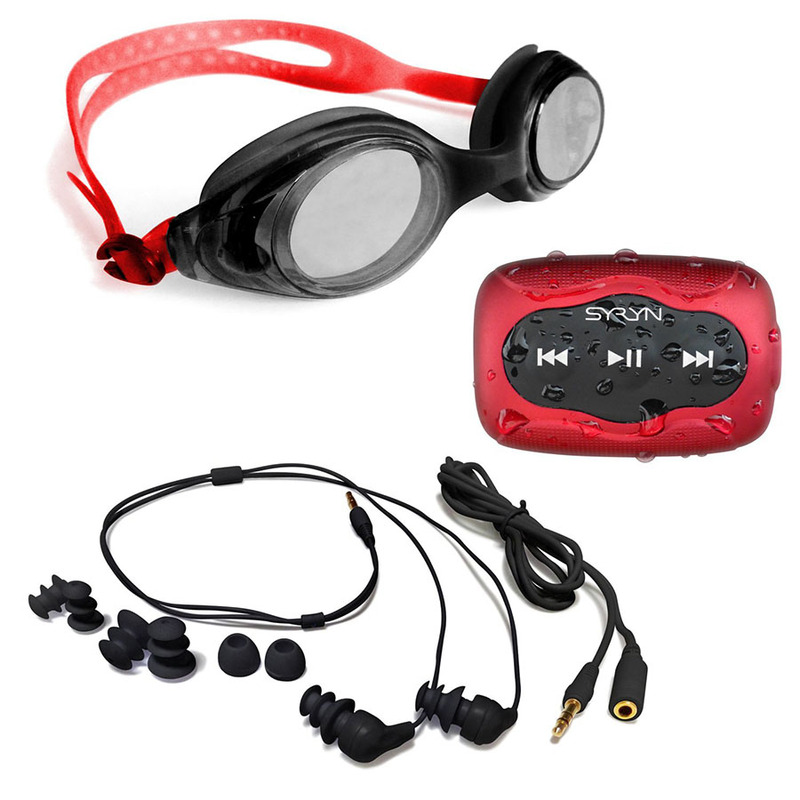 The SYRYN MP3 player is small and compact, easily clipping to your goggles or under a swim cap. These earbuds work great for flips and turns, even without a swim cap. The Swimbuds headphones and 8 GB SYRYN waterproof MP3 player deliver the performance and sound quality that rivals several other more expensive options. The new Swimbuds design features a short audio cable the easily connects to the MP3 player without the need for a lot of bulky cable management. The SYRYN waterproof MP3 player is smaller than it looks, and the clip is close to the back of the body. Audio file support includes MP3 and WMV formats. AAC audio files are not supported. USB file transfer is done via simple drag-and-drop on the computer. Check the best IEMs for running. With 8 GB storage capacity, you can keep up to 2,000 songs on this MP3 player. Three buttons control the play/pause, on/off, forward/reverse and shuffle features. It may take time to get all the presses figures out, but there are good instructions. Tip: to engage the shuffle function, simply press and hold the forward and reverse buttons at the same time until the indicator light changes color. A 1-meter audio extension cable is provided in case you need to attach the Swimbuds to a device in your pocket or other location. Battery life is great, easily exceeding 4 hours. Given that you’ll be listening to music underwater, these earbuds actually sound quite good. The overall frequency response is respectable, especially with a tight fit that seals the earbud deeper into the ear. You may even get a little extra bass response with a small amount of water in the ear canal, though too much will really start to muffle the overall sound. Maximum volume level from the SYRYN MP3 player is good and even better than some of the other common waterproof MP3 players. The Swimbuds headphones and 8 GB SYRYN waterproof MP3 player are a great package that delivers durable waterproof performance at a great price for any watersports enthusiast that needs reliable audio. The well-known Sony Walkman for swimming is still a great option. This waterproof MP3 has a behind the neck design, similar to Bluetooth in-ear headphones. This was one of the first MP3s that featured waterproofed design and it’s still one of the best choices if you want to listen to music near water. They aren’t the best for swimming but do many other things better than the alternatives. This is considered a sports MP3, but can also be used for swimming because of good water protection. It won’t work at 200ft of depth like an Apple iPod, but it’s good enough to use in any pool. Generally, the durability is very good as you’d expect from a Sony product. Not only will it survive a dip in the pool, but you can easily use it for exercise where you sweat extensively. For on land use, it’s great for running, working out or any other fast activity. The fit is stable and doesn’t fall out unless you use it underwater. Because of its size, the water makes quite a lot of pressure that can destabilize the earbuds. It is a problem for a lot of people who want to swim fast. They can easily fall out of ear canal and leak in water. Wearing a swimming cap does help with the problem a bit, but for underwater swimming, we recommend you pick some other model. By wearing a swimming cap you can improve the fit and greatly remedy the constant fit problems, but in the end, you can’t make the MP3 smaller. It features 4GB of space which is enough for about 1000 songs. The controls are very intuitive and you’ll get used to them very quickly. What are the top noise isolating earbuds? The battery charges in about 1 hour and gives from 6-8 hours of playtime, depending on how loud you play it. These are solid features that don’t disappoint. The sound quality is nothing special, it especially lacks in bass, but for swimming purposes, you don’t have that many better choices. The sound gets muffled if water comes into your ears, which can happen more times than you’d want if you have a problem keeping the earbuds on. As said before, wearing a swimming cap that covers your ears is highly recommended. 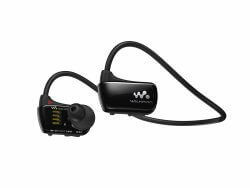 If you want waterproof, behind the neck MP3 headset for swimming, Sony Walkman NWZW273S is a good option, especially if you like Sony products and want to use it for sports in general. Diver™ is the best value for money waterproof MP3 player you can get right now. It offers great functionality underwater at a fraction of the price of alternatives. This is the budget, low-end waterproof MP3 but it still does its job well. The build quality and the feel can’t compare to iPod Shuffle, but it’s good enough. It’s completely waterproof and you can easily use it in the deepest pools (can easily survive 24 hours underwater). Just don’t go diving deep into the sea with it. It has a 1-year warranty which is 1 year less than waterproof iPods, but it is about 3 times cheaper. In case it breaks down you can easily replace it with very helpful and quick customer service. Once the one year warranty is void you can just get the 2nd Diver™ and you’ll still save on money. The problem that seems to face all waterproof MP3 player sets is the headphones. If you dive in too deep or too quickly, the water fills your ears and muffles the sound. This is an even bigger problem with rather cheaply made headphones that come with the Diver set. Thanks to the new redesign, it uses regular 3.5mm audio plug so you can easily replace the headphones with some other, better fitting waterproof earphones (like Swimbuds). Using Swimbuds and a swimming cap is highly recommended to keep the water out. Your experience in the pool will be much better. It has 4GB of space so this is more than iPod Shuffle, you can fill it with approximately 1000 songs. It only supports MP3 files which might be a nuisance for people who use other file types. If you use iTunes you’ll have to change the songs to MP3 files in order to play them with Diver. It’s compatible with PC and Mac and works nicely, you simply copy/paste the songs and you’re good to go. It charges with regular USB cable and the battery lasts about 3 hours per charge in general. This isn’t as good as an Apple iPod, but it is to be expected as this is a more budget-friendly product. Sound quality is decent if you use included earbuds, but you can improve this with better waterproof earphones. Generally, it the bass isn’t anything special and the accuracy and details aren’t mind-blowing. It is a budget model after all and the expectation of sound quality should be lowered. In the end, if you’re looking for a cheap, but quality waterproof MP3 player set for swimming, get Diver™ and you won’t be disappointed. Here you can find more about best Bluetooth headphones or top models of noise cancelling headphones. Please share your favorite waterproof model below. Maybe you find a great waterproof MP3 we’d like to put on the list. To keep updated in the future about best waterproof MP3s for swimming, subscribe or like this page.